With no chemical herbicides or pesticides used in our processes, it’s better for both your body and the environment. Because our plants get the optimal amount of water and nutrients, they grow with more consistency and better quality while preserving resources — in a shorter amount of time. And because we grow in a climate-controlled facility, everything is in season all year long. Finally, because our produce comes from right here in Ohio instead of being shipped from the Southwest U.S. or Mexico, it’s unbelievably fresh and tasty when it gets to your fork. We’ve come a long way since John and Tim started with a single 300-sq.-ft. greenhouse in early 2011. After quickly expanding through 3,000- and 10,000-sq.-ft. houses, we designed and built our current 60,000-sq.-ft. facility, complete with a fully automated NFT (Nutrient Film Technique) system. This innovative system recirculates a stream of nutrient solution across the plant roots, minimizing water and nutrient waste while allowing high yields from a small footprint. Today we can grow 1.4 million heads of lettuce annually, with enough space available to expand operations to 450,000 square feet and 18 million lettuce heads. And of course, our greenhouse uses no GMOs, chemical herbicides or pesticides — and never will. If you’ve ever driven by our greenhouse and wonder why our greenhouse is glowing pink, trust your eyes…it is not an illusion. 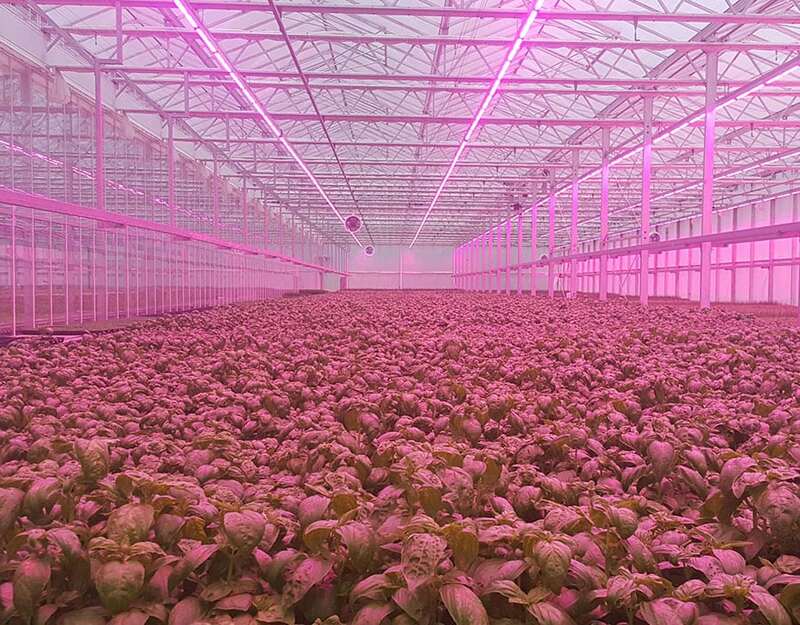 The “pink” lights you see are actually our LED growing lights. Science has proven that plants respond well to specific wavelengths of light, and LED lights have the ability to produce wavelength-specific light. The two most important wavelengths of light are RED and BLUE because these two colors help photosynthesis, stem elongation inhibition, and leaf expansion. The combination of the RED and BLUE lights running together actually result in the pink/purple color you see! We’re looking forward to being the market leader with the highest-quality, locally grown produce for the Midwest U.S. Today’s consumers are more educated than ever, and they’re demanding fresh, safe, local food. We believe this movement is only going to grow with time, and we’re enthusiastically ready to meet the new demand. Our state-of-the-art growing facilities and practices allow us to grow fresh produce year ‘round. Our network of grocery and foodservice distributors means our produce will always be in a store near you. And our low-cost producer status ensure the best possible prices. Always investing in our company to expand capacity and bring you new products, our goal is to add at least one acre a year to our facilities. Ambitious? Sure. But we think fresh, local produce is definitely worth it. We believe that healthy eating is the key to living a happy lift, and we take pride in providing fresh and delicious produce for our customers who believe the same thing. In our world, buying local doesn’t mean you’re just supporting local business, it also means you are getting the freshest lettuce and herbs possible. Don’t settle for lettuce and herbs that have to travel from California or Arizona before they reach your plate. Our produce is grown locally in our Burton, Ohio greenhouse to ensure that our customers always get fresh and delicious product every time! And because we grow everything hydroponically in our climate-controlled greenhouse, we produce all year round! Pick up our produce at your local grocery store today and let us be part of your happy and healthy lifestyle.